Sometimes Sci-Fi themed speakers can come off overly cheesy. Usually due to too many details on very cheap materials. This new USB speaker is fairly simple in looks and manages to just look cool without being over the top. Somehow, Brando has managed to come out with a lighted speaker without it looking like it should be paired with a blacklight or lava lamp. Although it still looks overly fitting for a geeky room, it still is not what I’d call tacky. It doesn’t really look nearly as interesting with the blue light off, and I’m curious how the light looks when it is bright in the room. I still find it cool though, and it’s not overly expensive. Which seems to be the other direction that Sci-Fi themed electronics go. They are either tacky or expensive, one of the two. 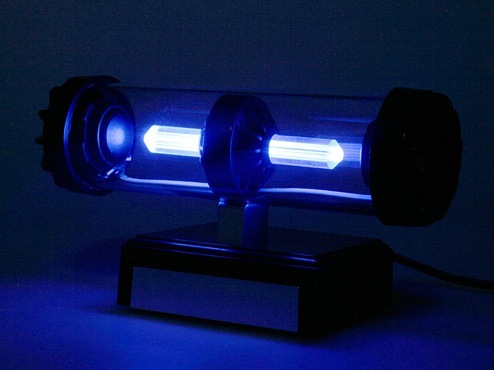 Brando’s USB LED Light Tube Speaker is currently being sold for $22. It comes with all the usual things every other USB speaker comes with, the speaker, a USB power cable as well as an audio cable. Nothing exciting there, and it probably won’t impress any audiophiles but it is a neat little novelty speaker. That would look great in some import car interiors.